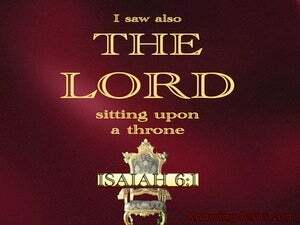 ﻿ Isaiah 6:1 In the year of King Uzziah's death I saw the Lord sitting on a throne, lofty and exalted, with the train of His robe filling the temple. In the year that King Uzziah died, I saw the Lord sitting upon his throne, high and exalted. The train of his robe filled the Temple. In the year that king Uzziah died I saw LORD sitting upon a throne, high and lifted up, and his train filled the temple. In the year that King Uzziah died, [in a vision] I saw the Lord sitting upon a throne, high and lifted up, and the skirts of His train filled the [most holy part of the] temple. In the year of the death of Uzziah the king, I saw the Lord sitting on a high and raised throne, and the hem of his robe [was] filling the temple. 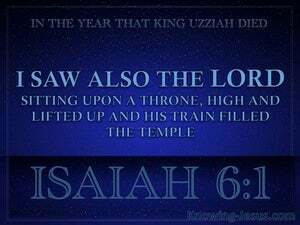 In the year that King Uzziah died I then saw the Lord sitting on a throne, high and lifted up, and His train filled the temple. In the same year that king Uzziah died, I saw the LORD sitting upon a high and glorious seat, and his train filled the temple. In the year that king Uzziah died I saw also the Lord sitting upon a throne, high and elevated, and his train filled the temple.